Before we get into the photography part of the trip let’s discuss kit i.e. clothing, camera gear & packing it all up! This is, without doubt, the hardest thing we as travelling photographers face. What lenses do I take? What other kit, tripods, filters etc…? It can be daunting if it’s your first time to a new location. My advice is to ask the people that know! Talk to us about what to expect, if there are any special requirements regarding kit, or if you have certain dietary needs. What are the arrangements for the onward travel to the accommodation or hides, plugs for charging, cleaning kit etc. There is no such thing as a stupid question because we are here to help. 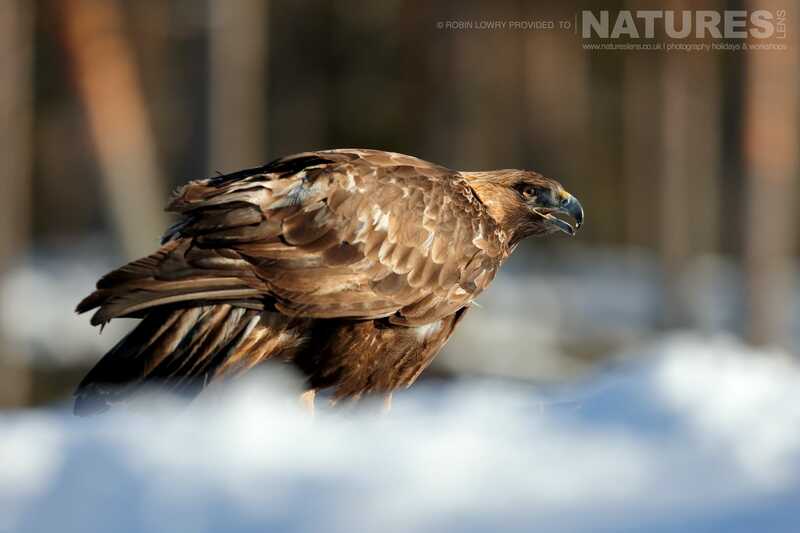 For the Golden Eagles of the Swedish Winter photography holiday, you will need long lenses such as the Canon EF 600mm f4 or Canon EF 500mm f4 but it is also a good idea to bring a wide angle lens in case there is an opportunity to photograph the Northern Lights. If you have two camera bodies, bring them both! The hides that we make use of have two holes to shoot from so it made sense to be set up with a short & a long lens. This way, you are ready for both action & close-up work. Beanbags were supplied in the hides, but you can also bring your own ball heads to attach to the mounting points inside the hide. You might also want to pack a small travel tripod just in case there is an opportunity to photograph the Northern Lights. When we arrived at SKELLEFTEÅ Airport, we were met by our local hosts & then driven to our accommodation which comprised of two houses a few metres apart from each other. Approximate journey time was about 45-minutes. After we had unloaded our kit, we enjoyed a delicious meal of spaghetti bolognese while discussing what the next 4 days might hold. Each morning, our hosts would prepare a packed breakfast & lunch for us so that we would have all the provisions we needed for our long days in the hide. This included plenty of hot water to make teas & coffees all day! The hides have heating as well as a chemical toilet, so they are very comfortable to spend time in without getting cold. There were a few occasions where I had to remove some layers as I was getting too warm! We were picked up & driven (only around 10 mins) to the location where there was a short walk on a hard surface to the hides. We had to enter the hide before daylight & stay in there until dusk in order to not spook the Eagles. After a quick breakfast, we set up our camera equipment & waited. It wasn’t long before we started to photograph some of the other residents of the forest such as Bullfinch, Woodpeckers, forest birds & red foxes. 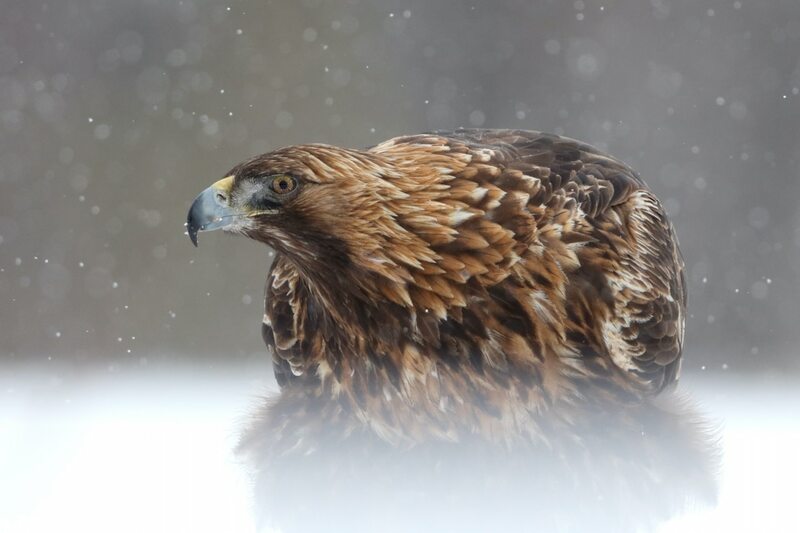 We had our first Golden Eagle visit not long after we had eaten our lunch. This amazing raptor glided down & sat on the close-up platform! It is important to not start shooting as soon as your subject appears as this is likely to spook them & they will leave. It is far better to wait until they settle down as they are more likely to stay for longer. This eagle was completely unphased by the number of clicks of camera shutters & hung around for quite some time! As the Golden Eagle took off, we saw him fly to the main feeding area on the hill. Luckily, our other cameras were already set up with longer lenses attached so we were prepared for a landing shot or a take-off shot! Thanks to the sun & the fresh snow on the ground, we were blessed with some amazing light which made for some awesome images! That evening on the way home from the hide, we noticed a faint green tint in the darkening sky. 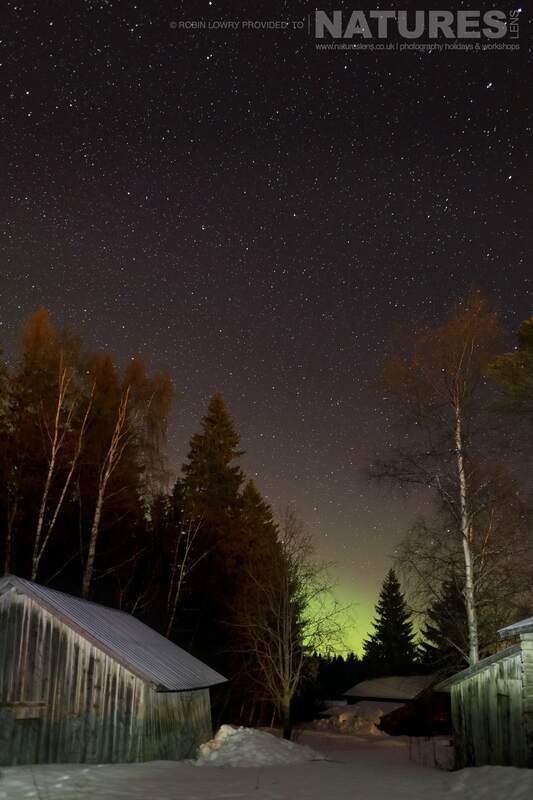 The Northern Lights! We couldn’t wait to photograph the lights & ate our dinner as fast as we could so that we could head back out again. We only had to go across the street to set up a tripod & shoot a 20-second exposure to see the beauty of the Aurora Borealis. It was just a small glimpse because it was low on the horizon but even so, it was an amazing spectacle. 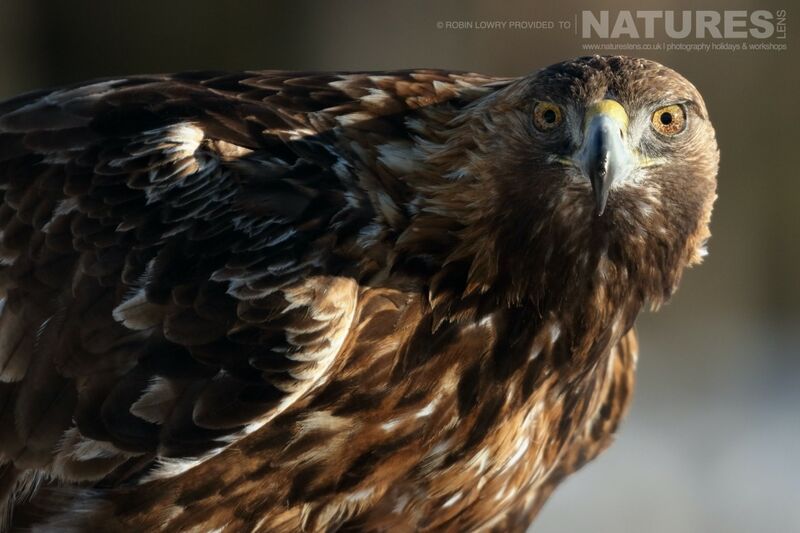 I photographed all the small birds & the Golden Eagle on the close-up platform using my full frame Canon EOS 1DX or 5DS but always on the Canon EF 300mm f2.8 which I love. The drawback to using this lens is that I can’t zoom, but it was a small price to pay for the clarity & speed of the lens. I used the 600mm for the action & flight shots or portraits at a greater distance which worked well. A 100-400mm on a cropped body would also be amazing & something I would definitely consider bringing along as the big lenses are a bit bulky, to say the least! By the last day, we had already seen a lot of action but as always, we wanted more! We were not disappointed. 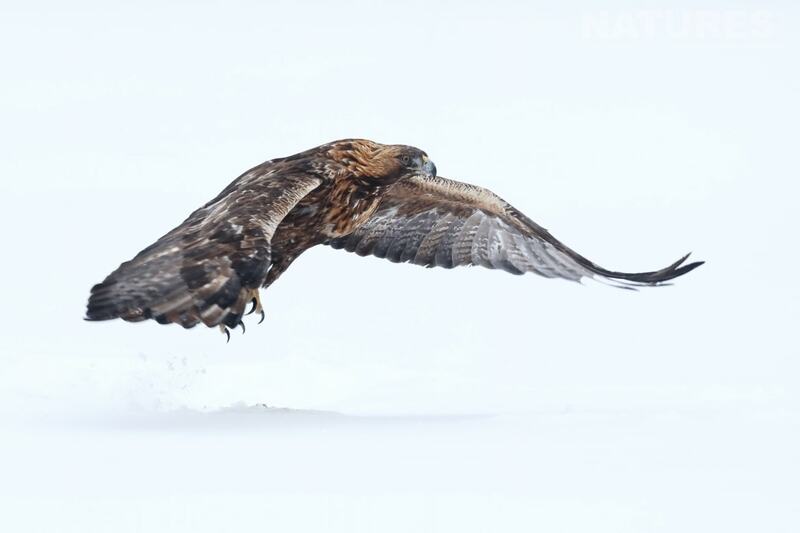 A Golden Eagle turned up twice on our last day! We photographed this magnificent raptor in flight using the low-level hide holes & these images have turned out to be my personal favourites! We finished the session by photographing some more small birds & then it was time to leave the hide. After a final glorious home-cooked meal, it was time for bed & then a leisurely trip back to the airport the next day for our journey back home. 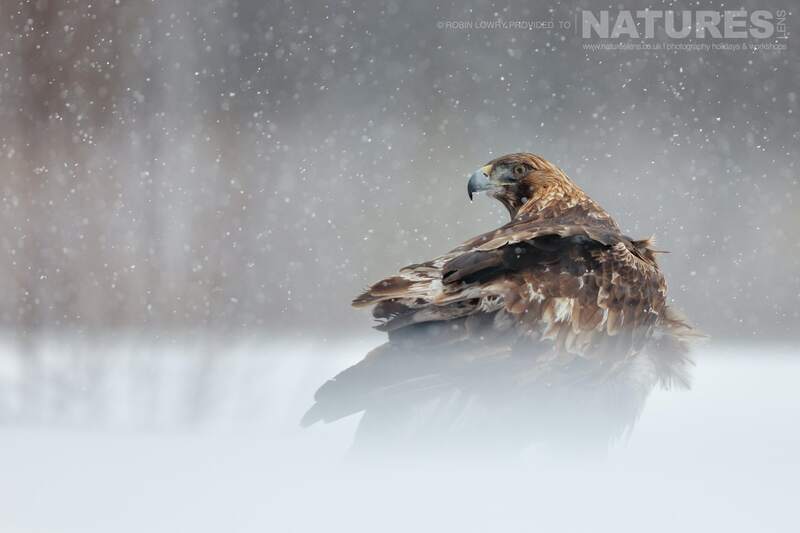 For me, the Golden Eagles of the Swedish Winter is one of those trips where you have the opportunity to experiment with your camera kit & your own photography skills. 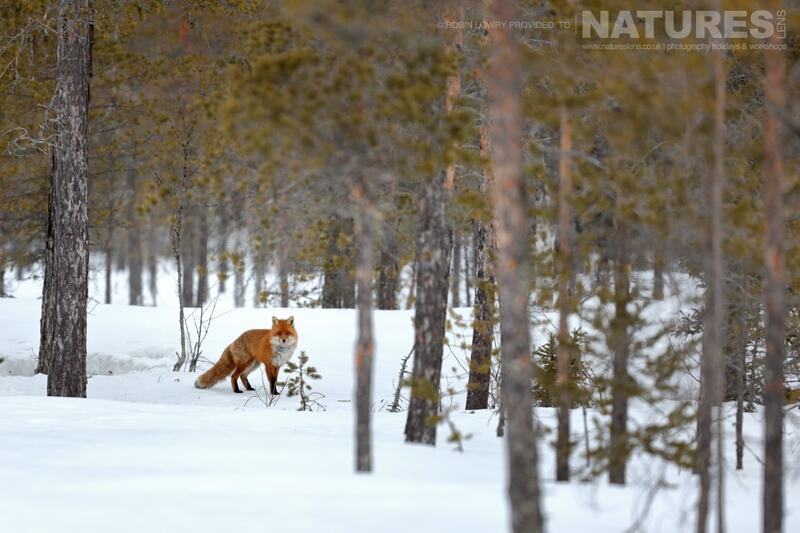 You will also come away with some absolutely stunning images of a multitude of wildlife & landscapes. This is one of those trips where you don’t have to have the latest camera equipment or massive lenses or even be a pro photographer. 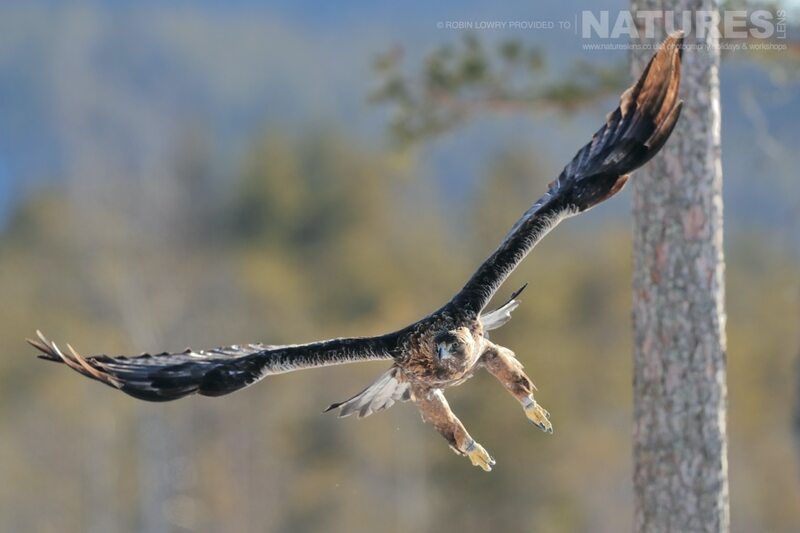 You could be a beginner & still get stunning images as I will be there to help you & to provide tuition so why not join me for the Golden Eagles of the Swedish Winter 2020 tour! Join for the to capture images of the the golden eagles & other birdlife, in , during January 1970, this is offered on a full board, non-shared basis. Join for the to capture images of the the fabulous white-tailed sea eagles, in , during January 1970, this is offered on a full board, non-shared basis. 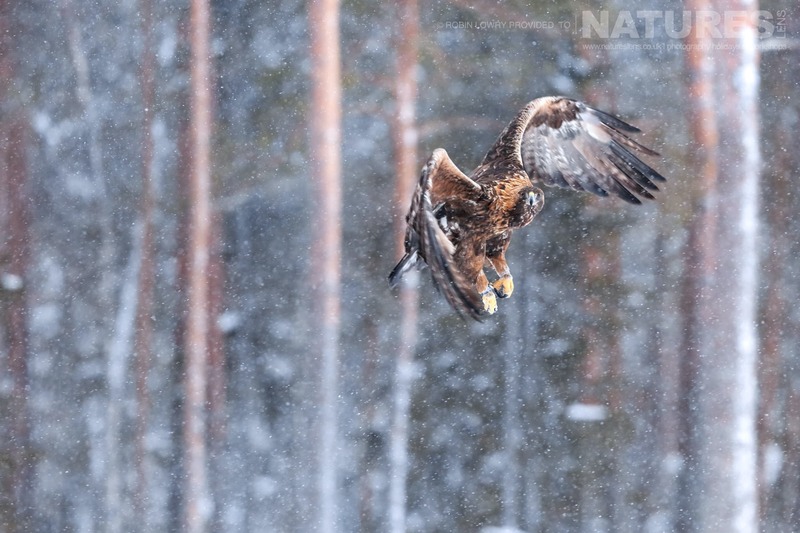 This entry was posted in galleries, photography holidays, sweden, worldwide tours and tagged eagle, golden eagle, sweden, winter. 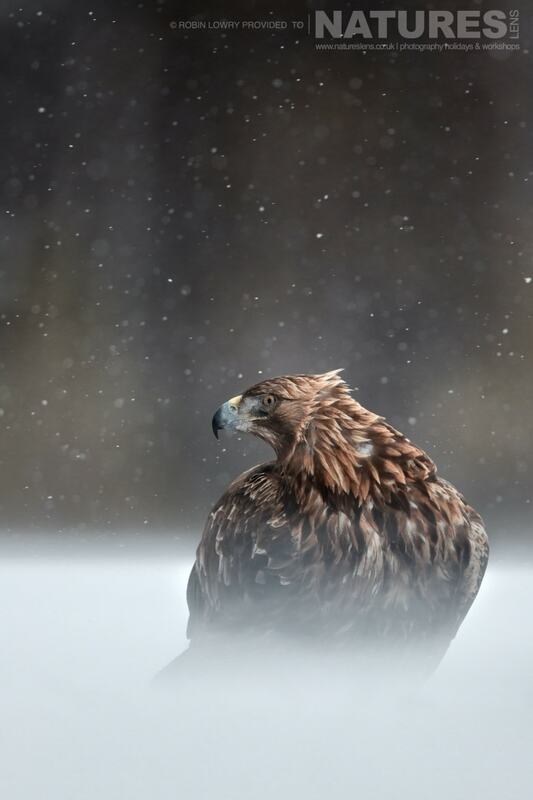 Whatever your query regarding our photography holiday, 10 images of the magnificent Golden Eagles of the Swedish Winter, please fill out your details below & we will get back to you.